Modeling and simulation of absorption, distribution, metabolism, and excretion of a drug as well as its effect are important tools in the drug development pipeline. FCC has a long-time experience in pharmacokinetic and pharmacodynamic data analysis in both applied research projects and in delivering contract services. Contour plots of a log-likelihood function for different values of systems noise: no system noise (top), diffusion 0.01 (bottom left), diffusion 0.1 (bottom right). Time-series data from different individuals with partly unknown or uncertain dynamics is encountered in both the preclinical and clinical phases of drug development. Nonlinear mixed effects (NLME) modeling has emerged as a de facto standard of how these data are being analyzed and interpreted. FCC has over the last couple of years made contributions to this field by introducing sensitivity based gradient computations of the so called approximate population likelihood. This has been demonstrated to result in a 10 to 100-fold performance improvement on typical benchmark problems. We are also applying techniques to refine existing methods for quantifying uncertainty in pharmacokinetic and pharmacodynamic models using stochastic differential equations and nonlinear filtering such as extended and unscented Kalman filters. Recently we have demonstrated how the use of stochastic differential equations regularize the optimization problem associated with maximum likelihood estimation of parameters of dynamical systems such as those encountered in pharmacokinetic and pharmacodynamic modeling. Our work in this technology field is supported by a close collaboration with our affiliated expert Prof Johan Gabrielsson, a world renowned authority in the field of pharmacokinetic and pharmacodynamic data analysis. Nonlinear mixed effects modeling has been used extensively in a project with AstraZeneca on studying tolerance and rebound of nonesterified fatty acids in obese and normal rats after nicotinic acid administration. We take part in the IMPACT project, which provides training and research on systems modeling tools and techniques of strategic interest for the pharmaceutical industry. The project is funded by EU as a FP7 Marie Curie European Industrial Doctorate scheme and is a collaboration between AstraZeneca, University of Warwick, FCC, Swedish University of Agricultural Sciences, and Uppsala University. Maxsim2 – a software for interactive exploration of model behavior. 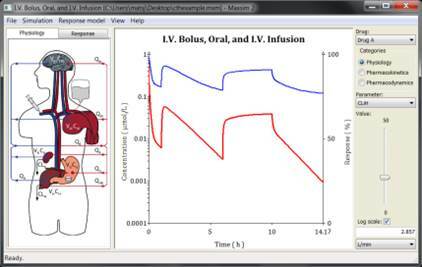 Maxsim2 is an easy to use, intuitive, and interactive application for pharmacokinetic and pharmacodynamic simulation developed at FCC. It has proven to be an excellent tool for dynamic interactive presentation of the interplay between physiology, pharmacology, and pharmacokinetic processes. Its ease of use yet wide scope makes it is an ideal application for both educational and professional users where thorough understanding and communication of pharmacodynamic and pharmacokinetic phenomena are important. We are also involved in projects on dose-response-time analysis, identifiability analysis, feedback mechanisms, and combination therapy.